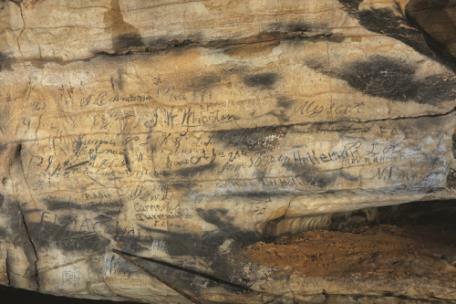 Cherokee inscriptions found in Manitou Cave, Al. For the first time, a team of scholars and archaeologists has recorded and interpreted Cherokee inscriptions in Manitou Cave, Al. These inscriptions reveal evidence of secluded ceremonial activities at a time of crisis for the Cherokee, who were displaced from their ancestral lands and sent westward on the Trail of Tears in the 1830s. The researchers concentrated on two main groups of Cherokee inscriptions found in Manitou Cave, a popular tourist site near Fort Payne, Al. Until now, indigenous uses of the cave had been unrecorded, as typical archaeological evidence like artifacts or deposits have been removed during its time as a tourist attraction. Along with Dr. Simek, the study’s authors are Beau Duke Carroll, who took part in the research as a graduate student in UT’s Department of Anthropology; Alan Cressler of the US Geological Survey; Tom Belt, a member of the United Keetoowah Band of Cherokees and coordinator of the Cherokee Language program at Western Carolina University; and Julie Reed, a member of the Cherokee Nation of Oklahoma and former faculty member in UT’s Department of History, now at Pennsylvania State University.